AUS-ROV utilise Remote Operated Vehicle Technology to provide safe and effective access to hazardous environments remotely. We perform inspection, survey and intervention using ROVs. Significant advances in robotic technology is helping industries achieve safer and more reliable productivity when operating within hazardous environments via use of remote control technologies. AUS-ROV harnesses these remotely operated robotic systems capabilities to provide a safer methodology in performing inspection or intervention tasks in hostile environments such as underwater.Through the use of ROV technology, we are eliminating the safety risk associated with human interaction in underwater, hazardous and previously unreachable areas. AUS-ROV considers the health, safety and well-being of everyone, including the communities in which we do business, to be of most significant importance when planning & delivering ROV Projects. Consideration of the environment is treated with utmost importance. All AUS-ROV operational objectives encompass a zero harm policy to ensure the ecosystems we work within do not sustain any negative impacts during the course of our activities. There is no compromise for quality at AUS-ROV. Our personnel have extensive experience in marine operations and their professional yet personable attitude facilitates positive outcomes every time. 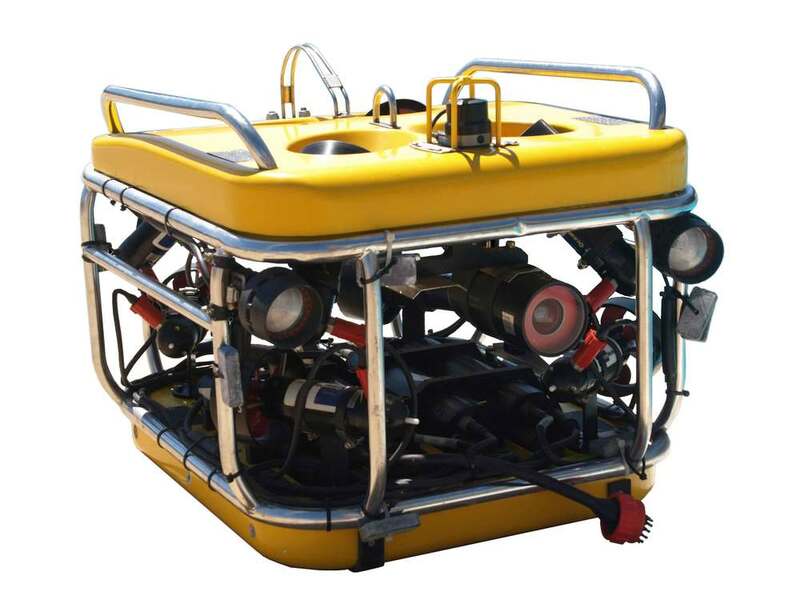 AUS-ROV provide turn-key solutions encompassing multiple disciplines simultaneously. AUS-ROV incorporates professionals from such fields as hydrographic surveying, electronic & mechatronic engineering, structural integrity engineering, naval architecture, geophysics, and ROV Pilot/Technician. Our world class team of highly skilled individuals incorporates professionals from such fields as hydrographic surveying, electronic & mechatronic engineering, structural integrity engineering, naval architecture, geophysics, construction project management and ROV Pilot/Technician. AUS-ROV's inventory of customised ROVs, crawlers, drones, support vessels and specialist tooling offers solutions to a diverse field of remote access tasks. On shelf we have high definition cameras, multi-beam sonars, single-function manipulators, and an array of probes and sensors. Technical solutions to complex problems are our expertise so please consider AUS-ROV for your next project. The unparalleled quality of our service delivery has assisted us to develop long and mutually prosperous association with our clients. Our interaction with partners and customers has given rise to lasting relationships, supported by our personable and professional business mentality, providing not only exemplary service, but a pleasurable business experience from start to finish. Here's what some of our clients have to say about AUS-ROV based on their personal experiences in working with us. "AUS-ROV demonstrate outstanding ability to concept, innovate and execute tailored ROV solutions, assisting Shell Australia in confirming integrity of critical assets. Alex and Adrian bring a level of professionalism and experience well beyond their years." "AUS-ROV have delivered a high quality service every time they have been engaged by ALS. Alex and Adrian work together seamlessly to provide a report that contains very clear images and comments based on their years of experience carrying out this type of work." "AUS-ROV was contracted to internally inspect our firewater tank at Ash Shihr Terminal, as it could not be taken out of service. The job was completed on schedule to our total satisfaction, despite the challenging conditions and environment. The close out reports were clear and concise, providing all the detail required. We would have no hesitation in using their services again." "Since taking on the 5 year Reservoir Inspection Contract, AUS-ROV have proven honest and reliable in their duties of carrying out the inspections. The extent of our inspections, at times with additional work such as item retrievals appears to be well within their capabilities. Safety and progressive thinking are strong points in their operations." Our specialist services include - marine and civil engineering, offshore oil and gas, geoscience & hydrography, environmental and documentary services, and safety and security services. AUS-ROV have been inspecting dam structures in South East Asia for many years and understand the value in confirming not only structural integrity, but design and dimensional details as well. Dam safety is a critical consideration for owners of these assets and given the recent increase in catastrophic failure of a number of dams around the world, it makes sense to utilise evolving remote technology which can assist in understanding the current condition of water assets and potentially preempt an unwanted event. AUS-ROV provides ROV inspection services to WaterNSW who own and operate 42 dams across New South Wales, a number of which we have been inspected with using our Remotely Operated Underwater Vehicles. The environmental survey is repeated every year by AUS-ROV on behalf of MCC to ensure that this particular outfall pipeline is operating to the design specification. At the surface, the corals that have been growing on the pipeline since its installation, appear to be flourishing in these rich with life waters off Madang Province in Papua New Guinea. The Teledyne SeaBotix vLBV ROV fitted with Sony HD Zoom Camera returns superior high definition video which enables us to identify the smallest of defects or anomalies when performing surveys. AUS-ROV have been performing work in Papua New Guinea since 2011 and have developed a strong understanding of the ways in which work must be carried out. AUS-ROV has performed underwater laser scanning of internal pipeline surfaces in order to provide baseline survey data modelling defects on the pipes internal surface. With repeat periodic surveys we can overlay models and quantify any extent of material loss to determine a rate of deterioration on critical infrastructure. With the sub-millimeter accuracy of the 2G Robotics ULS200 in optimal conditions, AUS-ROV can provide levels of certainty for underwater inspection of assets that our clients and partners want. AUS-ROV are world leaders in mini-ROV systems and deliver advanced technological solutions to engineering and environmental problems. AUS-ROV's Deep Ocean Engineering Vectored M5 ROV has was coupled with an Innovatum Smartrack Pipe Tracking System to perform a 10km General Visual Inspection (GVI) and Depth of Burial (DOB) Survey. This when backed with a full Bathymetric Survey helps the asset owner to understand the current seabed conditions and implement maintenance programs surrounding the data presented. When AUS-ROV perform operations, the finest professionals are engaged to work as a team to deliver our clients the best available results. Understanding the project is critical, working with AUS-ROV is ensuring you have the right equipment, people and methodologies in place to achieve project success! AUS-ROV has completed site civil structure ROV inspections as part of a scheduled power station outage for Origin Energy. The station shutdown enabled AUS-ROV access to critical cooling water infrastructure via remote access using ROV. AUS-ROV orchestrated two simultaneous ROV Inspection Teams to carry out the site inspection works which included custom built very high resolution 3D sonar imaging of a two kilometer tunnel, four 260m caissons and 600m of canals and a pump chamber housing six 2m diameter cooling water pumps and their associated concrete forebay screens. When getting the job done right is critical... AUS-ROV is the only answer! NSW Government has awarded a tender for Kirra Reef Marine Biota Monitoring Program which involves the ecological monitoring of benthic fauna, flora, and fish to assist in management of the Tweed River Entrance Sand Bypassing Project. AUS-ROV were engaged based on their experience and equipment development capabilities. Our ROV's carry custom developed HD Optical Zoom Cameras, additional 4k Video Cameras and integrated scientific instrumentation. 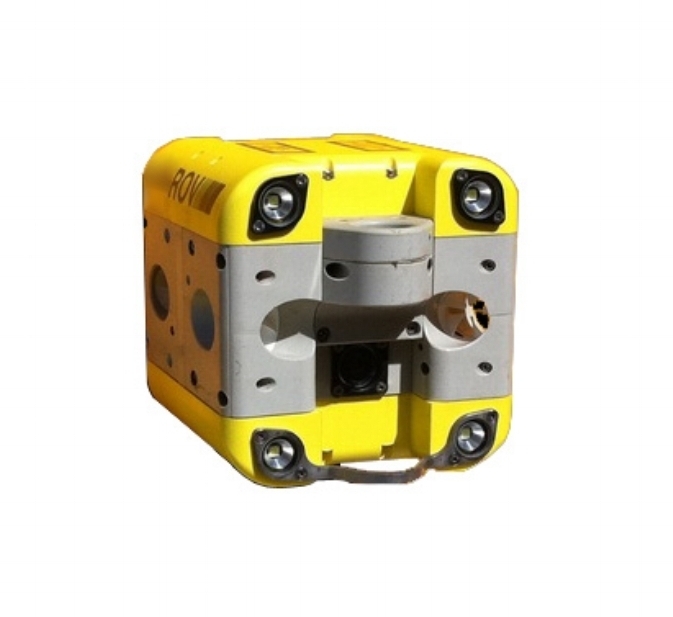 The ROV was fitted with USBL Navigation which provides real time GPS location of the ROV. AUS-ROV executed underwater benthic habitat surveying in high definition video at Kirra, Palm Beach, Kingscliff and Cook Island Reef Systems. Director Adrian Jahnke stands under Sydney Water's Michinbury Elevated Reservoir. AUS-ROV and Gray Diving Services performing dam inspections in Borneo. AUS-ROV partnered with Gray Diving Services to provide ROV inspection services and expert insight into the condition of Babagon Dam which supplies water to the city of Kota Kinabalu in Malaysian Borneo. After a recent earthquake, dam management exercised due diligence in ensuring the dam be inspected to comply with the dam safety management process. Through examination from ROV captured video and above water visual inspection, dam engineers made assertive conclusion that the dam structure was in good condition with allowable seepage levels and no signs of leaking through the joints obvesrved below the water line. ROV General Visual Inspection GVI being carried out on GCDA infrastructure. ROV General Visual Inspection was carried out at the Gold Coast Desalination Plant on one of the four flocculation tanks as part of the annual infrastructure inspection schedule. 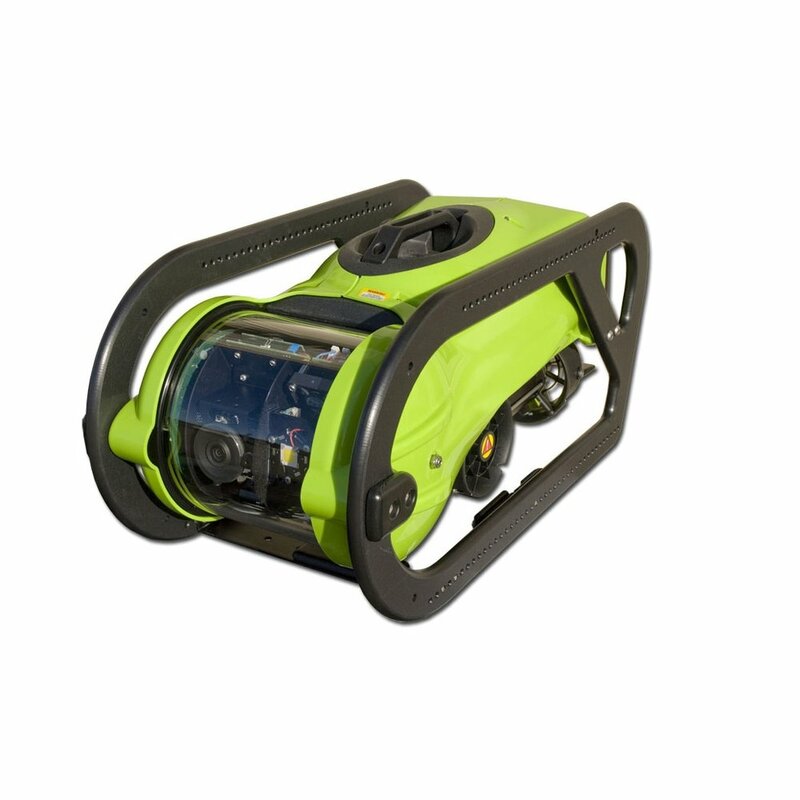 The ROV provides the safest, economical and productive underwater inspection method available in this modern day. 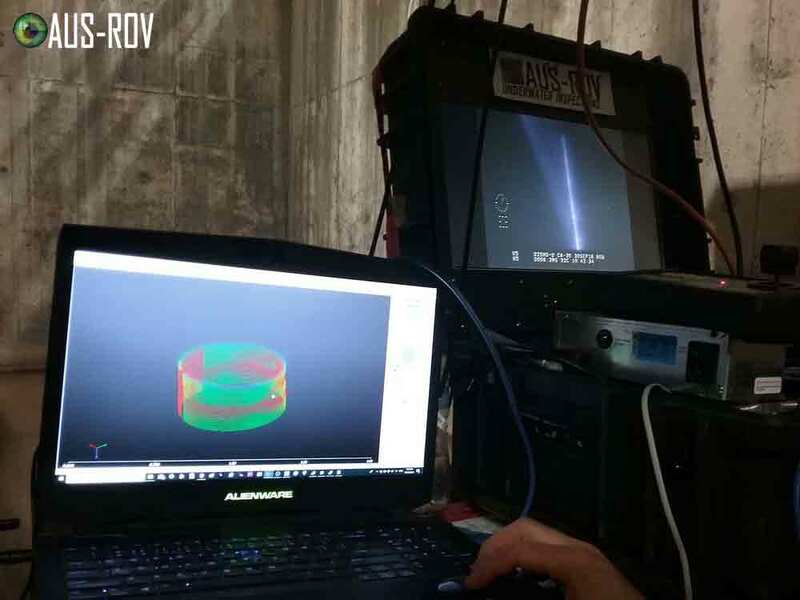 AUS-ROV operations team performed the ROV GVI using an ROV with integrated high definition optical zoom camera, which allows intimate detail of the infrastructure to be captured and played back to engineers and invested parties. AUS-ROV carry some of the most advanced and capable ROV's in the world and have a very competitive edge. Veolia Water consistently rely on AUS-ROV for their asset inspection work because they know our ability and we don't make mistakes. AUS-ROV's tank technicians conducting external general visual inspection. Acoustic Dopler Current Profiler and other Scientific Instruments at 110m depth. AUS-ROV have just recovered approximately $120,000 worth of environmental monitoring equipment offshore of Port Hacking, Sydney, NSW. The scientific mooring was deployed months ago and has been collecting a range of data from the ocean floor. A hydrophone is used to communicate with the mooring however the recovery buoy release mechanism failed to activate and float a recovery line to the surface. AUS-ROV used the vLBV300 with 2 function manipulator to attach a rope and recover the device. Conditions weren't favourable as the Australian Eastern Current was already running strong for the season. 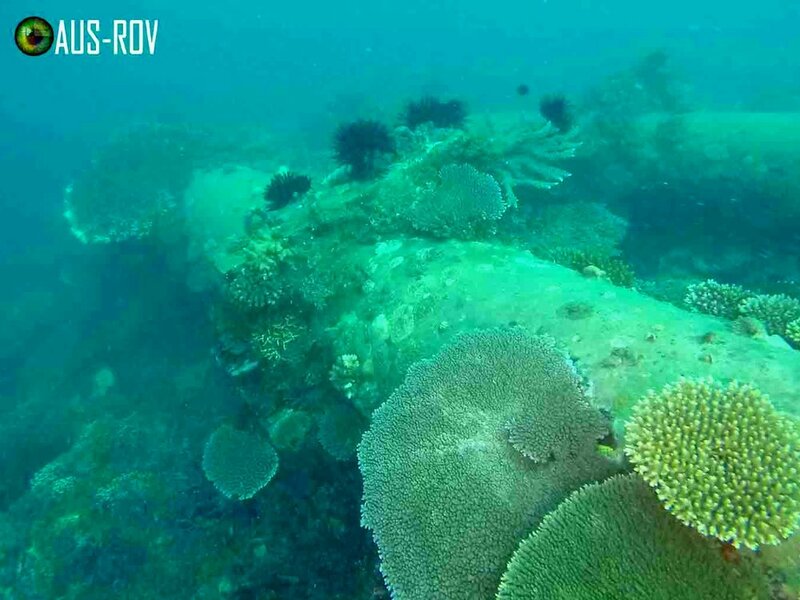 The mission was a difficult one but yet again AUS-ROV have proven themselves to be the best ROV service provider on the East Coast of Australia. Underwater Remote Actuated Water Sampling Device Designed by AUS-ROV. 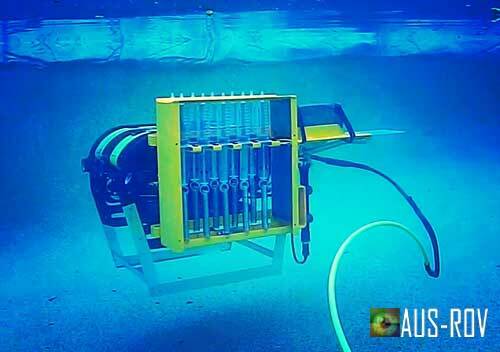 AUS-ROV have developed a remote actuated water sampling device for collection of water samples at depths. The sampler holds up to 12 x 100mL spring loaded syringes which can be activated using a sliding release plate. The system has been developed to fit the SeaBotix vLBV300 ROV which has the capability of diving to 950m when configured for it. Further testing at depths will be carried out at a later stage. Recently the system was used to take water samples up to 500m into a pipeline. AUS-ROV have a strong future in mechatronics and systems development with the addition of two in house mechatronic engineers. AUS-ROV has a unique spread of inspection class ROV's to service all industries. AUS-ROV has taken ownership of the newest member of the ever growing fleet of ROV's on hand in our East Coast Workshop. The DOE M5 ROV is extremely powerful, with a forward thrust in excess of 68kg and payload carrying capability over 50kg, the M5 is capable of performing cable tracking and light work class ROV duties. This ROV brings strength, adaptability and power to the front line of AUS-ROV's workforce. 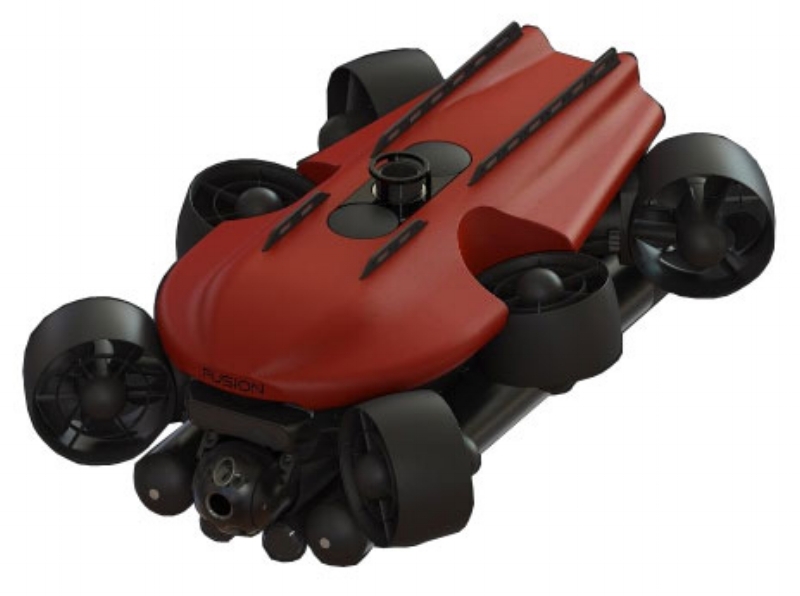 Click the button below to learn more about this ROV. SeaBotix LBV200 ROV ready to inspect valves inside the dam's intake pipeline. At north pine dam the SeaBotix LBV200 ROV was used to inspect 10 intake valves within a vertical riser shaft. At a depth of 30m the vertical riser turns 90 degrees to run horizontally over to the North Pine Dam Water Treatment Plant. AUS-ROV inspected the pipeline to 70m horizontal penetration to give SEQ Water’s engineers the opportunity to view the internal wall surface and inspect the main pipeline valve between the dam and the treatment plant. SEQ Water follow stringent inspection programs and have welcomed changes in available technology such as ROVs, allowing for a safer, more cost effective, non-traditional approach. SeaBotix vLBV300 returning to Sydney after a challenging day at sea. AUS-ROV Director Adrian Jahnke training PNG and Chinese Nationals in PNG. AUS-ROV has a wealth of knowledge when it comes to ROV operations across many sectors. Whether inspecting a water tank in the Middle East, performing deep sea research off Sydney or inspecting offshore infrastructure in Papua New Guinea, AUS-ROV Directors' Alex and Adrian Jahnke have the experience and skills to successfully plan and execute the most complex of ROV intervention projects. The world’s largest oil and gas companies have put their faith in our ability to perform ROV operations of significant complexity and to date have not failed. AUS-ROV know of and understand the potential challenges of working in the marine industry and can personally provide their expert services on your next project. 500 Megawatt Pumped Storage Hydro Electric Power Station at Waivenhoe Dam. Wivenhoe Power Station is the only pumped storage hydroelectric plant in QLD. It consists of two 250 megawatt units that are the largest hydro machines in Australia and weigh 1,500 tonnes each. AUS-ROV performed ROV General Visual Inspection (GVI) of the intake screens and turbine / pump shaft and bearing at the beginning of July. The operations team deployed the vLBV300 High Definition ROV from approximately 13 metres above the water level with the specially designed quick deployment and recovery system from SeaBotix. The ROV provided high resolution video of the turbine components, intake screens and concrete foundations the power station stands on. Deploying the vLBV300 ROV from the intake tower platform at Hinze Dam. AdelaideAqua Engineer and AUS-ROV Pilot conduct tunnel inspection offshore. AUS-ROV were successful in their bid to perform an inspection for AdelaideAqua at the Adelaide Desalination Plant. The lads used the very capable SeaBotix vLBV300 High Definition ROV to complete the inspections of the onshore and offshore intake and outfall risers and tunnel entries. The offshore work was carried out in 20 knot winds with conditions worsening through the day. AUS-ROV and the team at Whyalla Dive Services kept the project moving at steady pace with their experience at this site proving advantageous. The video below portrays some insight into the project. The Deep Sea Pipeline Inspection Team at Basamuk Bay, PNG. Another offshore deep sea project has been carried out by AUS-ROV, this time performing works as part of an environmental monitoring condition for a mine in remote Papua New Guinea. The pipeline which releases tailings at a depth of 150m and drops off to 300m has to be inspected to ensure that there are no leaks above the Surface Mixed Layers consisting of the Euphotic Zone Depth (UZD @ 80m), Upwelling Depth (UWD @ 100m) and Mixed-layer Depth (MLD @ 120m). Sediment sampling and continual monitoring for environmental impacts are something AUS-ROV personnel are passionate about and an intimate association with environmental assessors involved in this particular project will be an ongoing focus. AUS-ROV and Whyalla Diving personnel performing offshore tunnel inspection. AUS-ROV's Adrian and Alex Jahnke achieved 1380m of tunnel inspection at Adelaide Desalination Plant recently. The inspection was to identify if the chemical lines cover plates were still in tact since operations started a few years ago. The client was pleased to see this was the case and can rest assured that divers will not need to be called in to perform maintenance works. The inspection was carried out using a SeaBotix LBV300 with 750m of fibre optic umbilical. The tunnel was accessed from both offshore and onshore ends and allowed for approximately 1400m of horizontal tunnel to be inspected. AUS-ROV have just upgraded to a vLBV300 and are expanding our tunnel inspection capacity considerably. If you are in a position where your flooded tunnel needs inspection, AUS-ROV are the experts in Australia. AUS-ROV and satisfied client representatives after 700m tunnel inspection. Visual inspection of a seawater inlet tunnel which feeds West Lakes, South Australia has been executed by AUS-ROV special operations unit. A crane was met on site to lift the 6.5t concrete lid for access to the tunnel. AUS-ROV deployed the LBV300/4 full fibre optic system with 750m of tether on hand winch. The ROV Pilot then 'flew' the ROV to the offshore intake riser 700m seaward of the access shaft. Additional 1080 Lumen LED external lights and the ROV's high resolution camera resulted in quality video footage for identifying in fine detail the current condition of the internal surface of the 3.5m diameter tunnel. This was the first inspection carried out in 36 years and the client was pleased the structural integrity remains un-compromised. Further to this AUS-ROV Environmental Scientist Adrian Jahnke identified several fish species inhabiting the tunnel, concluding that this water asset not only provides clean seawater to West Lakes tidal ecosystem but a safe habitat for fish to occupy. OCTOBER 2014 DAM INSPECTION FOR SEQ WATER AT LITTLE NERANG DAM ON THE GOLD COAST. About to deploy the SeaBotix LBV200 ROV at Little Nerang Dam, Gold Coast. AUS-ROV and ROV Downunder performed an ROV general visual inspection (GVI) on Little Nerang Dam in the Gold Coast Hinterland on Thursday, November 23, 2014. Previous inspections conducted by commercial divers failed to locate the last of five 90 degree upward facing intake valves that protrude from the concrete dam structure. Using a Tritech Micron Imaging Sonar, AUS-ROV Operations Team were able to locate all five of the bell mouths and provide visual confirmation on their integrity and blockage status. The project team also investigated the dewatering valve gate and confirmed what divers were not able to see on previous inspection. SEQ Water Management responsible for the operation of this dam were pleasantly impressed with the SeaBotix LBV200's video quality and ability to capture critical information which strongly defines the scope of works required to ensure the City of Gold Coast has access to clean drinking water captured in the pristine hinterland of the Gold Coast. An inquisitive dolphin comes in to checkout the ROV in operation. Tony Bramley of Whyalla Dive engaged AUS-ROV to perform an ROV inspection on a disused mussel lease in Wallaroo, SA. The weather was perfect and visibility was around 20m which allowed for some great filming. The concrete blocks that make up the lease are positioned in grid form and connected by ropes. From the ROV footage we were able to determine the extent to which the infrastructure is still in tact and what method of removal can be used to clean up the site and make it more eco friendly. Some local dolphins came in to say g'day also, making for some great footage. The 30m Diameter Fire Service Tank for Petromasila Oil Export Terminal. 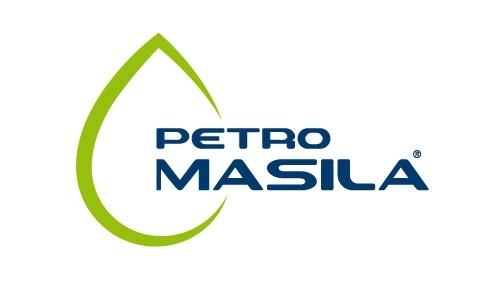 AUS-ROV have made a name for themselves in the Middle East, successfully capturing over five hundred UT spot readings across the steel base of Petromasila's 30m diameter, 20m high and 13ML capacity fire water tank. 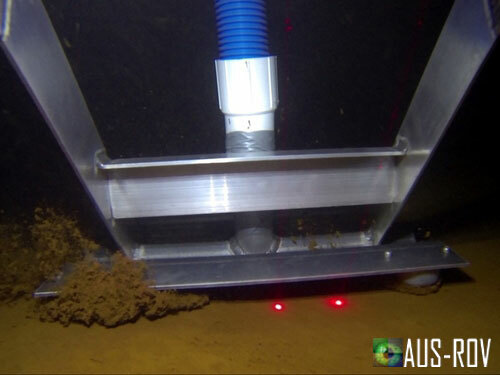 AUS-ROV used their remote vacuum system to clean sections of the tank where heavy sediments were encountered. This allowed for AUS-ROV to confidently inspect approximately 80% of the tanks base with random spot thickness checks. This fire tank has been in constant service for over 20 years and cannot be taken offline and drained due to the need to protect the crude oil tanks in the event of a fire. This was one of the most satisfying projects attempted to date for AUS-ROV personnel. A Wobbegong Shark camouflages well at Mermaid Reef, Gold Coast. AUS-ROV recently won a contract to provide ROV services for a local benthic habitat survey. The project involved mobilising a survey vessel and ROV to the inshore waters of Gold Coast from Miami up to Southport. Areas of interest included Mermaid Reef, Narrowneck Artificial Reef and the Wreck of the Scottish Prince located just out front of Marina Mirage in Southport. The survey included 24 x 100m transects and a 'fly over' narrowneck reef and the Scottish Prince. We can assure you that the inshore waters of the Gold Coast are alive and flourishing with an immense diversity of flora and fauna. ROV Pilot/Tech Adrian Jahnke operating the SeaBotix LBV offshore of Adelaide. AdelaideAqua recently engaged Whyalla Diving Services and AUS-ROV to perform an internal visual inspection of the Adelaide Desalination Plant's Seawater Intake Structures. The project was carried out in extremely perfect weather conditions with great visibility. AUS-ROV's Seabotix LBV200 was the perfect lightweight ROV for mobilising to South Australia and successfully penetrated the tunnel to the limit of it's 250m tether. AUS-ROV specialise in Desalination Plant Sea Water Intake and Outfall Infrastructure ROV Inspections and can develop any technology our customers require for ensuring their water assets are maintained in good working order. The 750m capable penetration distance LBV300 ROV and Pilot Adrian Jahnke. AUS-ROV have performed a 650m internal pipeline inspection recently on behalf of Trility Water. This full length pipeline inspection of the 400mm diameter seawater intake pipe provided engineers a close visual insight into the condition of the pipeline and answered integrity questions relating to critical components of the intake structure. AUS-ROV delivers final written reports detailing their findings on all civil structures they inspect. AUS-ROV received credit from the client on the professional and successful completion of the project. AUS-ROV are established experts in the field of tunnel and pipeline investigation s.
Remotely Operated Underwater Cleaning Vehicle in Action. 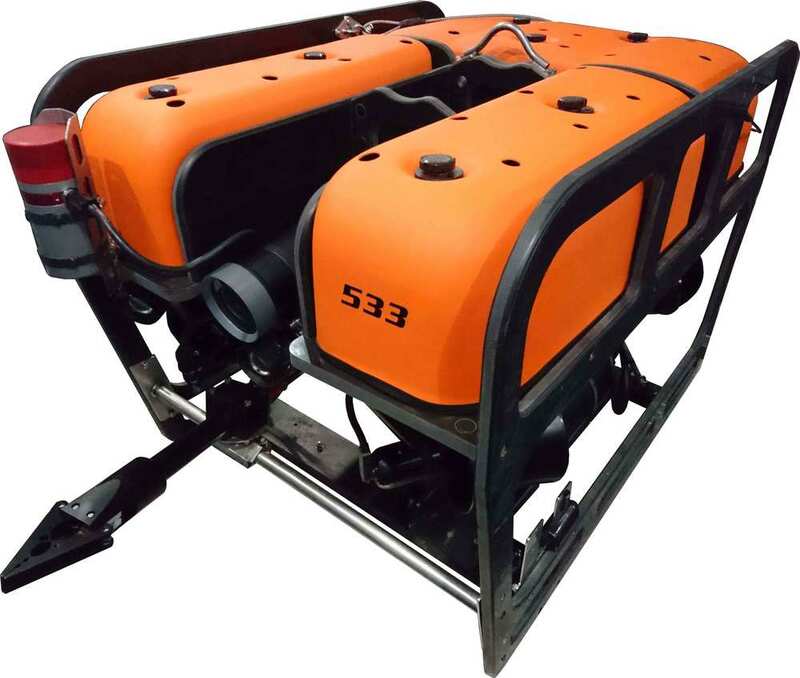 AUS-ROV R&D developed a remotely operated vehicle vacuum cleaning system for water tanks which allows tanks to be kept online whilst sediment is being removed. The system incorporates a custom made vacuum suction head fitted to the Seabotix LBV200 ROV. The tank floor is remote control cleaned using this system which saves water, eliminates confined space entry, and only requires two personnel to carry out the operation. Thickness testing of a steel water tank's floor and shell can then be achieved by ROV UT Instrumentation. Adrian Jahnke from AUS-ROV pondering the cause of his friend's death. AUS-ROV received a call advising that a friend had jumped approximately 20m from a tree above a cliff into a waterhole at Dalwood Falls, NSW and failed to surface. AUS-ROV quickly mobilised their Seabotix LBV200 ROV and 3 jaw mechanical grabber to the site of the incident where NSW police officer gave permission to attempt search and recovery operations. As the full moon rose over the water AUS-ROV conducted ROV search of the waterhole. At 9.20pm the body was located at a depth of 7.4m. The 3 jaw grabber took a firm grip of the body and returned to the surface. AUS-ROV would like to thank all NSW Police and SES personnel involved in the operation. CCTV Tractor Crawler System about to perform an inspection for Veolia Water. 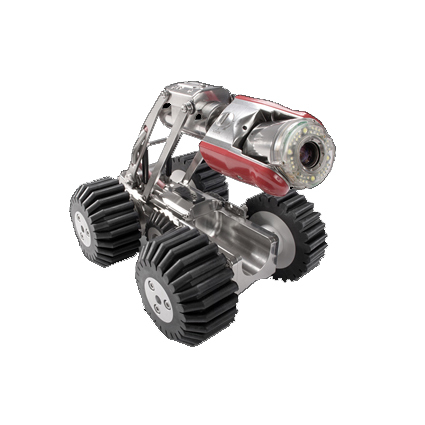 AUS-ROV perform CCTV Crawler pipeline and tunnel inspections using an extensive range of tractor crawler systems. The vehicles we use have the capability of surveying pipes of diameters as small as 100mm and as large as 2000mm. We can provide customised crawler systems with capability to penetrate distances of up to 6500m from one access point without the need to relocate to the next available point of entry. AUS-ROV recently surveyed the wastewater pipeline system and return brine water tunnel network for Veolia Water at the Gold Coast Desalination Plant. If you need CCTV Inspection of your pipeline or tunnel systems then get in touch with us and we will do our best to devise a solution that works best for you. AUS-ROV Company Directors Alexander and Adrian Jahnke. Adrian and Alex Jahnke of AUS-ROV Underwater Inspections celebrated the completion of a successful second year of operations in the ROV industry. To add to celebration on the day AUS-ROV were awarded contracts from both Shell Australia and Veolia Water. In two years AUS-ROV have achieved a solid footprint in the ROV market and specialise in water tank inspections, pipeline surveys, marine surveys, tunnel inspections, vessel hull inspections and sub marine infrastructure inspections. AUS-ROV Directors extend a huge thank you to our collaborative partner, Bill Bulloch of ROV Downunder for his continued support from his offshore postings. Visual inside Gold Coast Desalination Plant Filtered Seawater Tank. AUS-ROV and ROV Downunder collaborated with Veolia Water to execute this inspection of the Gold Coast Desalination Plant's filtered seawater tank. The footage was captured in high definition 1080p video providing significant detail of the internal condition of the water tank and it's components. AUS-ROV have been providing the highest standard of remotely operated underwater vehicle services for over two years at the Gold Coast Desalination Plant and look forward to the next inspection which involves a pipeline crawler system in a dry tunnel. ROV UWILD Inspection of Bulk Chemical Carrier Offshore of Bunbury, WA. With days notice AUS-ROV mobilised an ROV system and team from Perth to Bunbury and meet up with Kurt Haunold and J Cortez of Harbour Services Australia and loaded our equipment onto their launch vessel Harbour Achiever and headed to sea to inspect the anchored and awaiting Stenaweco Spirit . The propeller, 6m diameter propellor and rudder were inspected first followed by passes of the port side, starboard and undercarriage checking for damage, anti-fouling condition, marine growth and condition of the bilge keels and sea chest grates, fasteners and mousing. The inspection was completed in under 7 hours and the HD footage provided the owner a clear picture of the state of their vessel hull. Diver suiting up for Fire Water Tank Internal Dive Clean. AUS-ROV provide grout injection support at Collins Weir in Atherton Tablelands. This sixty year old weir in the Atherton Tablelands was losing water through a corroded drain valve. SunWater engineers decided to plug the drain with a quick forming grout. The strong suction force at the intake made it unsafe for a diver to conduct work. AUS-ROV were able to use the three jaw grabber on the SeaBotix LBV200 to grip the grout injection hose and hold it at the entrance to the drain intake whilst the grout was injected. AUS-ROV can provide underwater construction support in all types of aquatic environments. We have a comprehensive spread of ROV's and Subsea Tooling available. Fire Water Tank Inspections using ROV Technology for Shell Australia. This month the team at AUS-ROV were safety inducted to work on Shell Petroleum sites throughout Australia. The first assignment was an ROV Fire Water Tank Inspection of the internal condition of the fire water tank at the Brisbane Shell Distribution Centre. The inspection provided strong evidence to support the health of the tank structure and allowed the Tank Integrity Engineers to determine the maintenance and further inspection requirements of the tank using the High Definition Video taken of the entire internal surface of the tank. AUS-ROV will be performing inspections throughout Australia on behalf of Shell Petroleum. Fire Water Tank Inspections are required under legislation for Fire Service Maintenance. A fire water tank at a Bunning's Warehouse under inspection by AUS-ROV. Papua New Guinea Local Island of Daru Children Fishing. AUS-ROV were in Papua New Guinea where they accompanied a team of marine scientists from FRC Environmental to fulfill the ROV component of a marine and coastal environment assessment for a future port development on the remote island of Daru near the head of the Fly River. AUS-ROV conducted ROV transects at GPS coordinates around the island which were filmed in high definition video for species identification and soft coral monitoring during the construction of the port. Use of ROV technology was adopted by scientists to perform the underwater filming as the local environment is habitat to large saltwater crocodiles, sharks and marine stingers. Pilings ROV inspected due to early rejection during pile driving at Curtis Island. The team at AUS-ROV have been busy travelling to and from Gladstone to execute underwater inspections of the internal walls and base of two test pilings that have been driven into the bedrock at Curtis Island in Gladstone Harbour. The engineers and geotechs will use the footage captured to identify the means necessary to prepare the foundations prior to placement of concrete. Visibility was a difficulty which was encountered with a sediment layer of around 6m hampering the ROV's ability to get to the bottom of the piling. After several attempts and pumping the sludge out from the bottom, AUS-ROV were able to successfully capture footage that clearly identifies the geological condition of the seabed within the piling. Image captured by the ROV's on board High Definition Camera. AUS-ROV performed an offshore operation with diver assistance to undertake inspections of the Gold Coast Desalination Plant's seawater intake riser approximately 2km off Tugun Beach. The dive team from Gilberts swiftly removed the access panel to the intake structure and assisted AUS-ROV's SeaBotix LBV200 ROV with conducting an internal visual inspection of the concrete riser and tunnel. Objectives were to identify levels of marine growth, presence of sea life, structural integrity of the concrete casing and sediment buildup in the sump at the bottom depth of 90m. Gilberts divers conducted weld and sacrificial anode inspections around the intake dome structure as the ROV performed the inspection inside the tunnel. ROV Entering Confined Space of Fire Water Tank for Spectrum Fire Queensland. AUS-ROV Underwater Inspections have been contracted to conduct inspections on all of their Fire Service Tanks across Queensland. Thankfully industry has shifted focus toward the importance of human lives on work sites throughout Australia and with greater access to technology these days, ROV's are quickly becoming the norm when conducting inspections in confined spaces. There is no risk to human life as we deploy our ROV inside the confined space of a Fire Water Tank to inspect the internal condition of all components and identify sediment depths. If your Fire Service Tanks or Potable Drinking Water Tanks require inspection and maintenance think Remotely Operated Vehicles... Think AUS-ROV! SeaBotix LBV200 Inspecting Concrete Wall of Gold Coast Desalination Plant's Flocculation Tanks. AUS-ROV won a tender to perform rov inspections at the Gold Coast Desalination Plant. The pre-treatment water tanks under inspection perform flocculation where destabilised particles conglomerate into larger aggregates so that they can be separated from the pre-treated water. This processing ensures unwanted fine particles and minerals in the water are removed before it enters the reverse osmosis system. It is important to ensure that all process infrastructure be inspected and maintained to mitigate against the disruption of water supply to residents of South East Queensland. ROV's allow inspection of infrastructure with minimal disturbance whilst removing the safety risks posed to commercial divers. ROV and a Senior Ecologist Divers pre-descent. The SeaBotix LBV200 was put through it's paces whilst conducting an observational survey of benthic habitats at two local reefs off the South East Queensland Coast. The study was performed alongside research divers under taxing conditions with a surging ground swell and strong currents creating a difficult dive environment. Despite the conditions the SeaBotix fared well and AUS-ROV pilots captured some great video footage for the client. Setting up the ROV System on-board the work vessel was complete and ready to descend in under fifteen minutes. AUS-ROV achieved positioning of fish monitoring devices and retrieval of survey apperatus.